You've probably noticed, but just in case, 2015 is almost over! After the Star Wars premier, the final office Christmas parties, and the big celebrations of Hanukkah and Christmas conclude, we'll be left with those lingering, last days of the year. And on those days, I get the itch and the urge to make resolutions and pull out my bucket list. The possibilities of a fresh, new year get my adrenaline pumping! And yet, even in my most determined years, I've rarely kept up with the deliberate work toward those goals. My energy wanes after a few weeks. This year I'm going a different way. I'm putting my goal out there to the big world, gathering companions to hold me accountable, and carving time out every day to work toward the one thing that I want to accomplish. What is THE thing that I've been hoping to accomplish and putting it on the back burner, over and over? We all have at least one of those things, don't we? Being brave and communicating your goal to others helps solidify it. Yes, public embarrassment is possible, but so is total success with a team of cheerleaders supporting you along the way. So, I'm laying it out there, universe, I'm writing a book. In 2016, I'm writing a book. And I'm taking you along for the journey. Just so we're all on the same page, I've never written a book and I have no book deal in the works. However, I know that I have a book in me - a useful, high-quality, unique book - and I'm going to get it out! And just maybe a publisher or book agent might see it in the works and jump on it. And if they don't, I'm ready to self-publish and share! Beginning in early January, I'll be sharing my voyage with you over 100 days. Have you tried a 100-days project? I've challenged myself to 30-day goals, but not yet 100, and I'm scared and pumped to make this book happen. Follow @parscaeli on Instagram and Twitter with the hashtag #100daysproject_writeabook to see all my steps along the way. This is a new step for me. Though I love my friends and community, I rarely ask people to help me achieve my goals. So, I'm turning myself inside out, and pulling together a team of goal-driven folks I'm calling The Finders. We are all working toward some goal over the 100 days. Some of us are wanting to commit to daily exercise over 100 days and others are taking incremental steps to build our own businesses or open an online shop. We are connecting to hold one another accountable, to offer honest feedback, and to help us be kinder to ourselves than we might be on our own. It's the most loving kick in the pants that we've each been needing. Research on reaching your goals and getting closer to your dreams. This one speaks for itself, but I've been schooling myself on all the failure wisdom I can prior to beginning this journey. I'm not doing so because I believe I'll fail but, rather, to see how I can work with my own missteps, road blocks, and mistakes because they will happen. They always do. I want to learn how to wrap myself around the challenge and take it as part of the journey. I suspect some of my greatest learning might happen this way. Before you embark on your journey, be ready to weave your challenges into your story rather than let them stand in your way. Failure should be our teacher. I thrive in routine, but I also rebel against it. Oh, the paradox. My plan is to have a designated time every day to write and to photograph for the book. Typically I am a late night worker, but for this, I think I will need a fresh mind so I'm planning to wake before the house does to have some quite time to myself. I've heard from so many other moms that this is the key to success! So, I'm going to give it a try. Consider when is the best time for you to make your goal happen. Can you make it a consistent time every day? Your goals for 2016? Which ones are you willing to go for? So, what is it you want to do in 2016? Is there one actionable goal that you can take real steps toward in a daily and deliberate way?? Join the party! If you'd like to be a part of The Finders group as we challenge and encourage one another, send me an email with your goal at mj@parscaeli.com. But, don't hesitate, I'll be closing off the group on December 31st as we launch our 100 days January 5. And, remember, you can follow my big goal to write a book using the hashtag #100daysproject_writeabook! Make your own hashtag for your goal and share it in the comments so we can follow and throw love your way! My magical two-week break has come to an end, and I'm delighted to report that it was filled with togetherness, laughter, crafting and creating, rest, and ample movie watching (have you seen the new Annie?). I sunk into my home and blissfully forgot what day it was or what had to be done by when, and I enjoyed my husband and my children and my extended family and good friends. This was just the kind of recharge that I needed after a busy, awesome year on Pars Caeli and elsewhere. Connected with brands and networks that I admire and wanted to partner alongside: I joined Pollinate Media, which enabled me to get my creative juices flowing for specific brands like: Office Depot, Wet Ones and Elmer's Glue, Wet-Nap, and All You magazine. I became a Wayfair Homemaker, and I've guest posted for them as well as hosted a Housewarming Party here. I've worked with the wonderful folks at Minted to show Valentines, business cards, and Christmas greetings that are great art pieces. Collaborated with makers I admire and respect: like my ladies of the Endless Summer Projects series and the party for Ali and the NYE Bash. Sheri, Joy, and I cooked up a six-part series for kids in the kitchen entitled Mini Cooks. Created for the Cricut Design Space Star challenge and collaborated with a new and awesome group of artists over a serious of four challenges. Contributed to sites that have inspired me: I'm so grateful to Jen and Steph for letting me join their teams. With Jen, I've focused on that you can do to create special moments with your children. And our homemade daffodil wreath was one of her top posts from 2014! It warms my heart. With Steph over on Modern Parents, Messy Kids, I've created a collection of printables for boredom busting, summer reading, organization, and more! I've grown while putting my graphic design muscles out there to help parents and kids alike. I started my own business. It's been a super secret goal of mine for a very long time. The title entrepreneur is exhilarating, and I'm owning it! Pars Caeli, LLC, opened officially at the end of October with a giant employee roll of one. I kind of still can't believe it, but I'm so grateful, a wonderful blessing of 2014 for me. All of these check marks have been very good for me as a mother, wife, professional, and human. In 2014, I was able to shush my inner critic, that mean girl who has often kept me from jumping on the trampoline of possibility. I crafted a lot of ideas and put my tenacity to the test. I showed my children that they can be recognized for their creations, their thoughts, and, moreover, they can lead and they can influence. We have conversations now that start something like, "When I grow up, I'm going to start a business that ..." I'm not signing any of them up for business school yet, but I love that their minds are moving in new directions. Unlike some of my favorite people on the interwebs (whose angst I understand and whose energy will be missed), I'm not tired of social media or of blogs. Indeed, I've grown deeper in love. Friends, we have so much potential for collaboration and sincere learning through these communication tools, and I am here, and invested. And I thank you for joining in the party. So, what's up, what's up for 2015? It's boiling down to my one little word for the year: GOODNESS. I'm working this year first to foster my own goodness. To take care of myself with sleep and nutrition. To see, like really see, the avenues where I can assist others in powerful ways. To find new possibilities for this mouthpiece, Pars Caeli, to echo the goodness all around us. And to remind you and re-remind me when we go wayward that we are richly blessed. I even want to find NEW ways to help you have watershed moments of goodness - through shared story and new knowledge - and times when you see in new ways the incredible power you have to make goodness happen wherever you are. And what does that mean in a business sense? 1. REIMAGINE THE LOOK OF THIS SPACE: I've made updates to Pars Caeli through the years, but I'd like to pare down to the essentials and bring forth what you really want to see. Simplify and clarify, which means some behind-the-scenes work on my part to get this blog design to the sweet spot of beauty and ease of use. 2. ASK YOU MORE: I'm hiding my eyes on this one, but I've never done a reader survey! I know. I know. I want to know what you think. What keeps you coming back? 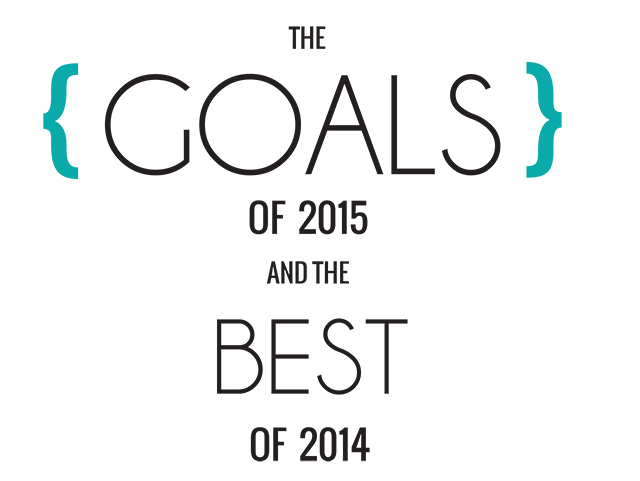 What should we multiply in 2015 and leave behind for 2014? Keep your eyes open for the happiest, simplest survey you ever did see. 3. COLLABORATE: Blogging would mean so much less to me if I had to do it all alone. I love working with other artists and makers to brainstorm and to learn the process. I want 2015 to include more and on new topics. I want to continue to embrace the right brand partners to bring you bigger and better projects - and even a few giveaways, because, you know you deserve it. 4. CONNECT: Keep it real with you. I tried five posts a week, and I've gone down to one. Three a week is just right for my full-time work and parenting schedule. I want Pars Caeli to add to my life and not detract so let's agree to be all-in three times a week (or for an hour on Saturday or Sunday like so many of you fabulous people do!). I also want to continue to share my life and reflections in ways that are fair to the privacy of my loved ones and to be open and honest with all of you. It's getting trickier as my children get older, but we can do it. Pinky promise. 5.PRODUCE: I have an AMAZING something happening with the good people at The Land of Nod that will be coming your way in the spring. And it's a real live product. EEK! And I have a few other products in the works that I can't wait to share with you. In 2015, I want to add a SHOP menu to Pars Caeli. This is another super secret dream of mine that I've had since I was a preschooler pretending with my stuffed animals (what, you didn't do that? ), and this is the year we put it to use. Have you set goals for this year? I'll admit that this is my first time sharing big goals, and it's more than a little scary. I mean, what if they don't really happen? Or if I fail? I'm going to hold on tight, and try to be good to myself if one of these goals leads me in a direction that does not make sense for the rest of my life - family, health, work. And, you know, let's all hug and forgive if we bump and fall along the way. Writing down big girl goals did not come so easily to me so I thank these brilliants who helped me in formal and informal ways in the prioritization process. Inspired by: Kelly of Studio DIY, Amy of Mom Advice and her M Challenge, Brittany's list on The House that Lars Built, Melanie Biehle's word, Kate's tactical list of four, Amy's insight at the beginning of 2015 on This Heart of Mine.